Today i am there to enlist the latest job opportunity from PEPCO Pakistan Jobs 2016-2017 Pakistan Electric Power Company Latest. Applications are being invited from the Power Producing Company which is named as PEPCO stand for Pakistan Electric Power Company (Pvt) Limited is the leading power and energy production company which is fulfilling the electricity needs of our country is offering all categories educational posts from Masters to Matric level senior and for junior posts with sound salary package and fringe benefits are required to apply. Applications are currently invited to fill the post in PEPCO which is being offered from Ex-Armed Forces are required to fill the following posts which includes (Deputy Manager (Major & equivalent retired from Armed Forces), Inspectors (Retired Junior Commissioned Officers form Armed Forces) and Sergeants (Retired Non-Junior Commissioned Officers form Armed Forces) are the posts which needs to be filled by the applicants for such posts. Applicants have to serve within Pakistan for electricity distribution companies. Applicants will be appointed for the period of 2 years wich will be subjected to satisfactory performance of the applicants Now, i will let you about its rest of the details and applying method below. 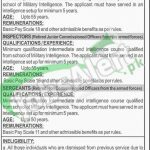 For all those these three posts the applicants should possess the Graduation qualification for Sr No,1 along with Intelligence Course from the School of Military Intelligence and the applicants should be having the 5 years expertise in Military are eligible to apply whereas for rest of the two posts Intermediate qualification is required with Intelligence Course from the School of Military Intelligence and the applicants should be having the 5 years expertise in Military will be counted as fit applicants to be employed here. Age limit should be 50-55 years is allowed to apply for the above posts. For Sr No,1 the pay will be given equivalent to BPS-18 Scale, for Sr No, 2 the applicants will be given salary equivalent to BPS Scale -16 and for last post salary will be given equivalent to BPS-11 with other benefits will be admissible. Interested candidates should submit their detailed Resume / CV, with two personal references and two recent passport size photographs should reach at the proper address. Last date for applying is 30th December 2016. Applicants who have been dismissed on account of disciplinary ground will mot be hired. Those applicants who have served in Intelligence/NTDC/WAPDA & PEPCO are ineligible to apply. Address: Director General (HR), PEPCO-192, WAPDA House, Lahore.